Today was the $1 socks and $3 t-shirt deal at old navy. Unfortunately if you didn't know about it before now it's too late, but you can go online to the old navy link (above) and print off a coupon for $10 off your next purchase of $50. They also have them available at Great Clips. 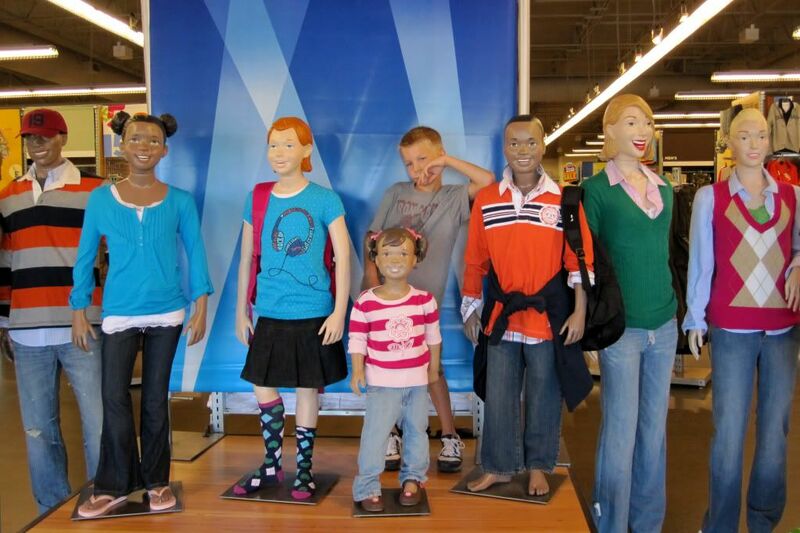 I was checking out today when I looked over and saw Little Man posing with the manequins. I had to quick grab my camera and freeze the moment. I'm sure the check out girl thought I was off my rocker, but I probably am and really didn't care what she thought. It was one of those unscripted Little Man moments... he might be a pain in my you know what sometimes, but he can also be funny and thoughtful and tender and... I guess it's those moments that make it all worth it. We're almost done with school shopping. Just a few more last minute things to find, which could probably wait until after school started if necessary. Little Man is starting soccer soon and I signed Pokey up for ice skating yesterday. I just need to find a piano teacher. I think getting the kids ready for school is a funny thing. One week ago I was a little sad about it coming so soon. But somehow over the last 6 days I've become ready. The children have been extra difficult, perhaps due to anxiety. Whatever the reason... it has helped me prepare emotionally and even look forward to the new school year to start. lol I didn't even notice him standing there till I started reading (shows you how ovservant I am) C: I know exactley what you mean about school. A week ago I was feeling the exact same way and the last few days it can't come soon enough!! After the holidays I will be ready for school to be over and summer to be here again C: funny little cycle! !